Do you spend more time on the internet than you should? Does the sudden brutal stabbing murder of a loved one give you feels? Can you remember at least one incident from high school that bothered you in some way? Relax; you’re not crazy — you’re an introvert! Welcome to the club! Still not sure? Take a look at these telltale signs, compiled by someone who nearly looked up ‘introvert’ in a dictionary. Only introverts know how to read. If you enjoy this quirky, archaic pastime, you might just be an introvert! Or dogs. Or one single dog. Anything mammalian, really, and birds too even. Most people punch a baby rabbit in the face every morning before breakfast, so if you see a baby rabbit and go, “Aw, so cute,” you’re probably an introvert. Normal people literally explode if they stay in the same room for more than an hour, which is why they’re always dancing in the street, paragliding, swimming to the moon etc. If you get home from a hard day’s work and just want to relax on the couch with a hot cup of tea, guess what, you big ol’ introvert? That’s right it means you are one. Wouldn’t you know it, introverts are all of these! Heaps more than the average ‘popular’ moron. Your inner world is just so rich, what with all of your observations about things; it’s a pity most people are too busy going “Blah blah blah, shopping, television!” to notice. But someone willing to humbly defer to your hidden genius will discover that you are a brilliant conversationalist who knows about a band. So if you’re an introvert, don’t worry! There are others like you, out there somewhere, suffering the same nearly-monthly indignity of someone saying, “Are you okay?” or “Wow, you came!” to them. Just remember: being an introvert makes you special and interesting, like a black or a gay. 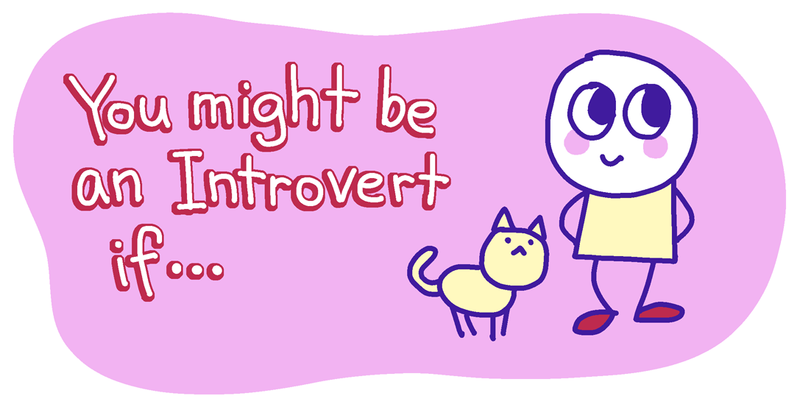 Let’s show some introvert pride! Next: Next post: You can now buy prints. Very instructional Series, Patrick, was brought to my attention thru Parcel, were you also aware that far from being a prat that can’t stand having their time interrupted for even one second to speak to a human person, people that hate talking on the phone are simply introverts, and need even more space than the space given by the distance that makes phone calling necessary, and so that’s why I they don’t like to talk to mom on the phone.